That's funny about the Compact being some sort of fast for environmentalists. You're on to something, I think. Like you, I never completely fall off the bandwagon but my green-ness ebbs and flows and every now and then I remind myself that I need a kick in the pants . . . or, as you call it, a little Greenhab. I proudly confess that I went to Target this morning... to return shoes we'd bought for a TruffulaKid. Reason for the return? I discovered that we already had a pair in the desired size, saved from his older brother. True, my eyes did not avert as I entered the store, straining for a glimpse of the goodies inside. But, as soon as we were finished with our transaction, we marched firmly back outside. Bring on the Greenhab! I think we're all of us trying to do a little better, bit by bit, at being green. And sometimes we don't live up to our own tough standards. But that's because our standards are high, not because what we do is bad or weak. You're trying to make a difference for yourself, your family, and for the world. That puts you in the Superhero Class, even if you slide back a little sometimes. Hey, even Superman had his off moments! By sharing your ups and downs with us at the Booth here, you're helping to make a difference not just in your own life, but in the lives of people like me, halfway around the world (in New Zealand), who you don't even know. That's the point at which "greeniosity" becomes viral, and we really do start to make a difference. Sharing knowledge makes knowledge powerful. We create change, and become change, when we share it with others. So I guess what I'm trying to say, in a really long-winded and not very efficient way (darn that "efficient" stuff we all have to do/be!) is welcome. I haven't gone the total green route for gifts, but I did vow to give up gift wrap. I will buy no more wrapping paper!! It's wasteful, expensive, not recyclable, not biodegradable, I can'at burn it in the fireplace... yada, yada, yada. I'm now reusing gift bags, wrapping in cloth napkins, getting artistic with packaging materials, etc. 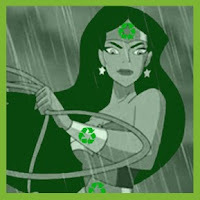 I feel much more eco-conscious. Good Luck! We will be cheering you on.